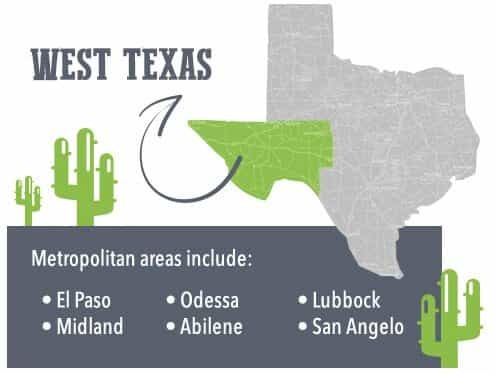 The West Texas region is comprised of the El Paso, Midland, Odessa, Abilene, Lubbock, and San Angelo metropolitan areas, in addition to a myriad of small towns that surround them. Many of the largely populated areas that make up West Texas are inhabited by a melting pot of demographics, some of which are associated with higher rates of substance abuse. A national survey of substance abuse treatment programs notes that those with 20 percent or more Latino clients served populations that were poorer with higher rates of substance abuse and drug-related criminal histories.1 High rates of poverty have also undoubtedly contributed to drug crime in the area. Interestingly, rates of poverty are highest in West Texas among the entire state and grow higher close to Mexican borders. The national per capita income for the United States in 2000 was $30,906 — not far above the $29,039 rate for the state of Texas — while West Texas was just $23,156.2 Comparably, poverty rates that year aligned at 12.4 percent nationwide, 15.4 percent for Texas, and 18.5 percent for West Texas.3 In West Texas border areas, the per capita income level was just $18,823, with a 25.7 percent poverty rate.4 In addition, substance abuse is more prevalent in the lower-income regions. Not only is drug abuse a popular pastime in the area, but transportation and distribution through the area and even out of state are prevalent, too. Often, Mexican cartels will recruit underage teens to aid in smuggling operations since they are exempt from federal drug charges in the United States. The region is home to five of the busiest ports of entry in the nation.26 Smugglers import these substances across Mexican-US borderlines and run the risk of arrest each time. Stash houses are also popular in the region and serve as home bases for traffickers to meet with dealers and store their supplies. Most of the time, no one lives in the stash house, and it is more often than not a rental property. Attached garages are preferred so dealers and transporters can pull vehicles into a private garage to load drugs out of plain sight. Those vehicles frequently show up at odd hours and may have various license plates from different states; they may even switch them out from one car to the next illegally. The traditional lifestyle doesn’t apply to individuals who hang around these houses. They aren’t going to work and coming home at the end of the day. They may sleep late and be up all night, and they might stay inside almost all the time, failing to even check the mail, pick up the newspaper on the front stoop, or mow the lawn. Efforts to scale back the potential for substance abuse span statewide. Texas has laws in place that make doctor shopping illegal, but it isn’t necessarily easy to know when someone is engaging in such practices. A strong prescription drug monitoring program is in place, as well as a lock-in program that forces individuals who are thought to have a substance abuse problem into using a specific pharmacy for their prescribed medications. On all fronts, these efforts are strong, but they only cover the scope of prescription pharmaceuticals. The Partnership for a Drug-Free Texas, the Texas Department of State Health Services, and Texas Suicide Prevention organization are all at your disposal in the West Texas region. On a map, West Texas may not look substantial.It contains a tiny slice of ground that connects New Mexico with Mexico proper, and it has very few large cities and towns to clutter up the landscape. But dig a little deeper and you might find that West Texas has a lot to offer. That is especially true when it comes to addiction recovery. There are a number of important and large treatment facilities for addiction that are located within West Texas. These are just a few of them. Aliviane, Inc.: This large behavioral health center serves the counties of West Texas, and it is headquartered in El Paso. The founders of this organization envision a world in which substance abuse issues are rare. They provide a number of educational classes in order to make that vision a reality. In addition, the organization offers comprehensive treatment programs for people who have already developed addictions. Both inpatient and outpatient programs are available, and there are programs made for adolescents too. The organization is minority owned, and it runs on a nonprofit basis. To find out more about enrollment, payment, and insurance payment acceptance, call (915) 782-4000. Alternatives Centre for Behavioral Health: This freestanding mental health and substance abuse facility strives to provide care in the least restrictive environment possible that could still deliver success. That means the team tries to help people with addictions on an outpatient basis, so they can continue to tap into the freedom of home and community as they heal. But there are also partial hospitalization programs and intensive outpatient programs for those who need a little more care and supervision. The team can provide classes in addiction development, relapse prevention skills, anger management, and more. And the team can provide drug testing, just to ensure that enrollees do not relapse while they access care. To find out about payments and insurance coverage, call (915) 757-7999. Recovery Alliance of El Paso: Since 1998, this organization has provided peer recovery services to people living with addictions in West Texas. The care is delivered on a residential basis, meaning that people with addictions move right into the treatment program for help. They can step away from the struggles of their communities and really focus on health, and the treatment rooms are clean and beautiful. The program lasts for 90 days, and during that time, people meet with recovery coaches as well as peers. They learn more about how others have recovered from addiction, and they develop skills they can use in order to stay sober when they are done with treatment. There are exit programs available to help people learn how to integrate into the community. All of the staff of the organization is in recovery, and they are willing to share their own stories to help people heal. Insurance payments are not accepted, but the group will help people in need to understand their funding options. To find out more and to enroll, call (915) 775-0505. Abilene Behavioral Health: This organization claims to provide the most comprehensive suite of addiction care services in West Texas, and they do offer a full suite of services. The group provides inpatient treatment, partial hospitalization, intensive outpatient programs, and outpatient treatment for adults. The team can also offer care for adolescents with addiction. They can assist with mental health concerns too, including depression, anxiety, and bipolar disorder. The team is well-trained, and every person on the staff is passionate about helping people to develop a positive and enjoyable life. The intake team in Abilene can help families understand the cost of care, and they can help families to find financial resources that can help. To find out more, call (800) 335-3498. Serenity House: This organization provides treatment for addictions throughout Texas. Most people who enroll start the healing process with medical detox, so they can get sober in a safe and controlled environment. Then, people move into a residential treatment program, so they have support around the clock as they start to learn more about how to preserve sobriety. Individual and group counseling plays a role in that healing program. Some people move on from residential treatment into outpatient treatment, so they can continue to learn and grow in sobriety. Aftercare programs round out the treatment process, and they might stretch on for months or even years after formal treatment ends. Payments from insurance programs are accepted. To find out more, call (866) 795-4673. The Springboard Center: This treatment center provides a number of different programs for addiction, including medical detox, inpatient care, outpatient care, and sober living homes. People who enroll are provided with aftercare support, so they can preserve the sober lessons they learn while they are in active treatment. There are family programs and equine-assisted programs for people looking for something a little different in recovery. There is a preadmissions screening involved with treatment, so teams can help to develop a customized care program that will help. Insurance payments are accepted, and there are sliding-scale payments for private-pay clients who cannot afford the full cost of care. To find out more, call (432) 620-0255. Palmer Drug Abuse Program: This Midland organization provides a community for people touched by addiction. This is a community of likeminded peers who all have their own struggles with addiction. They all want to get better, and they might all have their own tips and tricks they have used in the past that have either worked or failed. Together, they meet to discuss their issues, and together, they work for healing that will last. This is a group that follows the tenets of the 12-Step movement, and there are no costs involved. People who want to participate need do little more than simply show up to a meeting and express a wish to stay sober for the rest of life. There are meetings for adolescents, young adults, older adults, and family members. To find out more, call (432) 685-3645. The Alpha Center: Some people choose to tackle an addiction with the help of a large and connected treatment facility, but that is not the only way to heal. Smaller organizations can help too. The Alpha Center is one smaller addiction organization that could provide key assistance. The therapists who work here are dedicated to unlocking the trauma of the past and moving toward a healthier and happier future. They offer group therapy, individual counseling, neuro-endocrine rebalancing, and more. All care is provided on an outpatient basis. Payments from insurance programs are accepted. To find out more, call (432) 614-5720. Phoenix House: For more than 50 years, this organization has provided key help to people in need. This nonprofit treatment organization delivers evidence-based care for adults and adolescents struggling with addictions. A multidisciplinary team provides the care, and that team might include psychiatrists, social workers, family therapists, case managers, wellness specialists, and substance abuse counselors. There are inpatient and outpatient programs available. The team has special programs available for mothers, members of the military, and people with co-occurring disorders. Insurance payments are accepted. To find out more, call (888) 671-9392. The Right Step: This is one of the largest treatment providers in Texas, and there are several outposts in West Texas. The team here provides an innovative therapeutic approach that helps people to discover a meaningful life that is free of drugs and alcohol. There are inpatient programs and outpatient programs available. The clinical staff includes psychiatrists, therapists, addiction specialists, and nurses. The therapies they provide are based in the theory of “positive recovery,” which utilizes evidence-based therapies that are augmented by a person’s inner strengths and preferences. There is long-term recovery support for people who finish the program. Insurance payments are accepted. To find out more, call (844) 756-2653. Anchor West: This treatment program is made for men who have addiction issues. It combines conventional addiction treatment tools, such as counseling and support group meetings, with therapies men might enjoy, such as CrossFit. Men who enroll are also provided with life-skills training, so they can emerge from care with an understanding of how to develop a budget, get a job, communicate with loved ones, and find a safe place to live. Those practical skills can help men to feel safe and secure in sobriety, and that could keep them from relapsing. This residential program lasts for 90 days, and there is a 12-month aftercare program that extends the learning. Men who want even more support can move into sober living homes, where they can live and work alongside peers who are also in the recovery process. Insurance payments are accepted. To find out more, call (844) 413-2680 . Clearly, these are not all of the treatment programs in West Texas; there are many more. 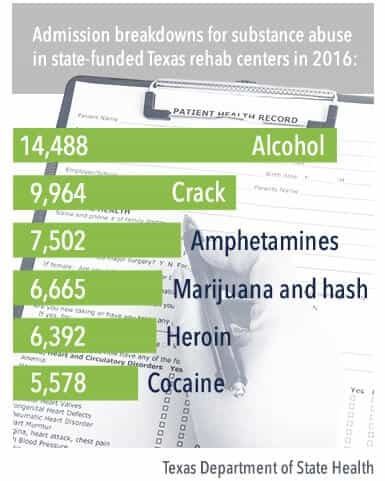 Texas residents have obviously invested a great deal in the addiction recovery movement. If you live in the area, you have options. It might be time to take advantage of them. Alvarez, J., Jason, L.A., Olson, B.D., Ferrari, J.R. & Davis, M.I. (2007). “Substance Abuse Prevalence and Treatment Among Latinos and Latinas.” Journal of Ethnicity in Substance Abuse. Accessed September 12, 2015. “Demographics.” (n.d.). Texas Tech University. Accessed September 12, 2015. “Texas Drug Control Update.” (n.d.). White House. Accessed September 12, 2015. Maxwell, J.C. (June 2012). “Substance Abuse Trends in Texas.” University of Texas. Accessed September 12, 2015. “Drug Facts among Texas Youth 2014.” (2014). Texas Department of State Health Services. Accessed September 12, 2015. “Underage Drinking in Texas.” (n.d.). Underage Drinking Enforcement Training Center. Accessed September 12, 2015. “State Estimates of Adult Mental Illness from the 2011 and 2012 National Surveys on Drug Use and Health.” (2014 Feb 28). Substance Abuse and Mental Health Services Administration. Accessed September 12, 2015. “Substance Abuse and Mental Health.” (n.d.). Helpguide. Accessed September 12, 2015. “State Statistics: Texas.” (n.d.). National Alliance on Mental Illness. Accessed September 12, 2015. “Reports.” (2013 Oct 7). Trust for America’s Health. Accessed September 12, 2015. “NCHS Data on Drug Poisoning Deaths.” (June 2015). Centers for Disease Control and Prevention. Accessed September 12, 2015. “Alcohol-related deaths: How does your state rank?.” (2014 Jun 27). CBS News. Accessed September 12, 2015. Grissom, B. (2010 Nov 23). “Accidental Overdoses Increase by 150% in Texas.” Texas Tribune. Accessed September 12, 2015. Leins, C. (2014 Oct 8). “U.S. Suicides Hit Highest Rate in 25 Years.” U.S. News. Accessed September 12, 2015. Langford, T., Busch, M. & Daniel, A. (2015 Jul 24). ”In Texas Jails, Hanging Most Common Suicide Method.” Texas Tribune. Accessed September 12, 2015. “Facts About Mental Illness and Suicide.” (n.d.). University of Washington. Accessed September 12, 2015. “Southwest Border HIDTA West Texas Partnership.” (n.d.). Office of National Drug Control Policy. Accessed September 12, 2015. “West Texas High Intensity Drug Trafficking Area.” (2011). U.S. Department of Justice. Accessed September 12, 2015. “More than 2 dozen arrested in West Texas heroin, cocaine trafficking sweep.” (2014 Jan 10). ABC News.Accessed September 12, 2015. “Texas Laws & Penalties.” (n.d.). NORML. Accessed September 12, 2015. 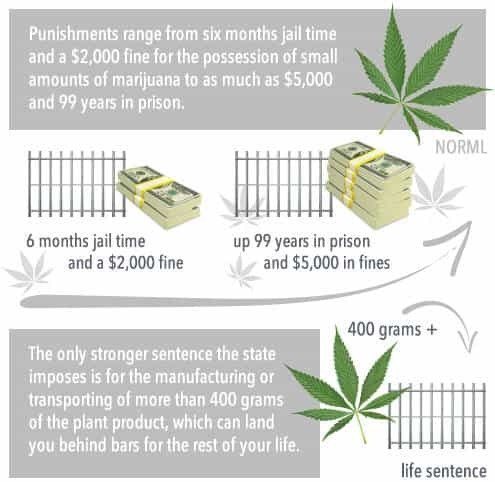 “Texas Drug Possession Laws.” (n.d.). FindLaw. Accessed September 12, 2015. Evans, T. & Tinsley, A.M. (2012 Aug 14). “Texas has nation’s largest prison population.” McClatchyDC.Accessed September 12, 2015. 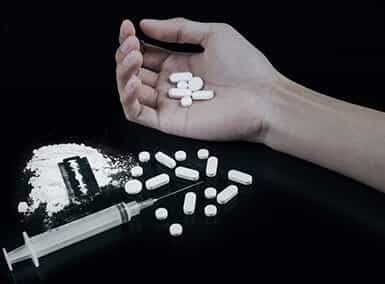 “Substance Abuse Statistics Texas Statewide Totals.” (n.d.). Texas Department of State Health Services. Accessed September 12, 2015. “Licensing Requirements – Substance Abuse Treatment Facilities.” (n.d.). Texas Department of State Health Services. Accessed September 12, 2015.